In the early ’90s, the so-called “Iron Archives” of Russian political documents from the Cold War era opened up to historians, shedding light on the earliest days of Mao Zedong and Joseph Stalin’s diplomatic alliance. But not all of the Russian documents were declassified at that time. The Woodrow Wilson International Center for Scholars has launched a new digital archive containing recently declassified materials from some 100 different international collections, including a cable Mao sent to Commander Filippov (Stalin’s alias) eagerly detailing his plans to study Russia and complaining about his poor health. The subsequent exchange between the two world leaders is as banal as their later correspondence would be ideological. Mao suggests, once his health improves, that they use the aerodrome in Weixian for his departure and he includes the exact dimensions of the landing strip. One wonders whether Obama and Israeli President Shimon Peres worked so closely together on travel details for their meetings in March. The details contained in the thousands of cables, telegrams and memos are part of the fun. Other documents exchanged between the KGB chairman and East German Minister in July, 1981 include blunt language about the difficulties of reading the Reagan Administration’s intentions and the importance of quashing the Polish Solidarity Movement. Because the world’s biggest issues tend to have long roots, there is a lot of material here that echoes today’s headlines. Here, the Soviet Minister of Foreign Affairs records a 1958 memo about his assessment of North Korea’s plans for a nuclear program. 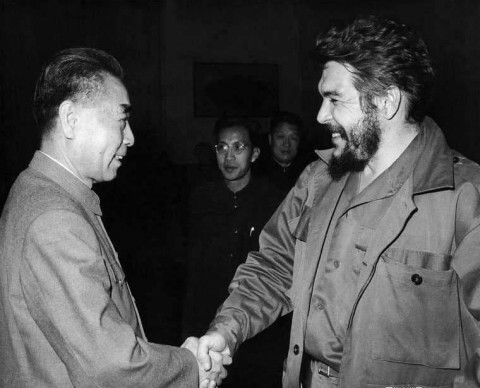 During a 1960 global communist delegation meeting, Mao Zedong spoke at length with Che Guevara about sugar sales, American influence and counter-revolutionaries. As a side note, the Wilson Center is a one of the more intellectual memorials to an American president. Woodrow Wilson was, after all, the only President of the United States to hold a Ph.D. The Center is one of the world’s top think tanks, with research and projects focused on U.S.-Russia relations, the Middle East, North Korea and, oddly, emerging nanotechnologies. But, of course, the Wilson Center is more known for its centrist analysis of international diplomacy issues. The new digital archive (whose tagline is “International History Declassified”) offers several ways to search: by place, year (beginning with1938) or subject. For scholars or history buffs, this is a trove worth browsing. Kate Rix writes about education and digital media. Visit her website: katerixwriter.com. As the Woodrow Wilson Center is headed by a traitor, Jane Harmon, one wonders how this will effect what is made public. There is a certain irony to the Center making once-secret communications public. Harmon, as you may recall, was caught on tape by the FBI negotiating with a foreign agent and famously ended her conversation with “this conversation never happened”.